Precast concrete cladding offers a cost-effective means of providing a robust, high-quality facade, with a great variety of durable textures, colours and patterns, including a range of facing materials such as stone and brick. It is also known as architectural precast concrete cladding. Self-finished architectural concrete uses a carefully selected range of natural materials and is sometimes referred to as ‘Reconstituted Stone’ or ‘Recon’ due to an appearance more akin to stone than the usual look of concrete. 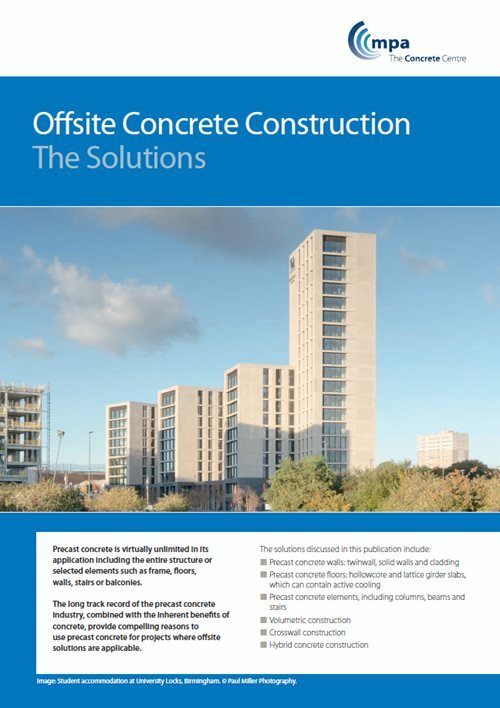 Precast concrete cladding can be installed quickly on site which, with just-in-time delivery, offers significant construction and programme benefits. Other benefits include quality controlled and predetermined surfaces, low waste and material efficiency and high thermal performance. Panels can be supported by the structural frame of a building, or self-supporting and restrained. Cladding panels can also be designed to be load bearing to support floors. Off-site production: providing resource efficiency through low-waste production and installation, quality control and fast construction programmes not affected by weather or labour shortages. Skilled production and installation: Panels are produced by skilled craftsmen in purpose-built factories, and installed by teams of specialists who have been trained in their safe handling and fixing. Quality control: Each stage of manufacture is inspected in accordance with an independently-certified quality system. Finish and dimensional accuracy are verified prior to delivery. Fast construction programmes: Manufacture takes place while the foundation and frame construction proceeds, enabling them to be delivered and installed on a just-in-time basis. Panels can be delivered with windows and insulation fitted in the factory, thus further accelerating the work of following trades. Early enclosure of dry envelope enables follow-on trades to start sooner. Range of unique, aesthetic options: A wide range of finishes, textures patterns and forms are achievable, with bespoke solutions provided. Construction efficiency: External scaffolding is generally not required as fixings are accessed from the rear of the panels. The design of panels can be designed to optimise crane usage and delivery. Low waste and material efficiency: Negligible waste is produced during production of units as they are fully engineered in the factory. Little or no packaging is required for delivery and installation. High thermal performance: Decrement delay can improve internal thermal comfort which can be supplemented by the thermal mass of the internal skin of an insulated concrete sandwich panel. Concrete panels provide excellent airtightness. Good acoustic insulation: Concrete provides excellent inherent acoustic insulation, making concrete cladding particularly useful in busy urban areas or noisy environments. Low maintenance: Concrete cladding typically requires little maintenance compared to other lighter-weight cladding solutions, providing lifecycle cost benefits. Fire resistance and no spread of flame: Concrete cladding offers excellent inherent resistance to fire, protecting occupants from the effect of external fires. Long-life and adaptability: Concrete cladding creates durable facades with a long usable life. They can also be simply dismantled with panels potentially being refurbished for further use or crushed to provide recycled aggregate and scrap steel. The majority of panels used in the UK are manufactured in UK or Ireland, with manufacturers offering a range of services and scale of output. Many are part of the Architectural and Structural Precast Association. Early discussion with cladding manufacturers is to be recommended, to provide specialist input in to the design development and to improve cost efficiency. A thickness of 150mm concrete is a good early assumption. Panels are typically designed to span either from column to column of floor to floor allowing large areas to be rapidly enclosed. Panels are fixed to frames with brackets designed to allow for three-dimensional adjustment. Manufacturers provide samples of mix and finish for specification and, once appointed, typically provide design services, producing drawings of each individual unit for coordination. Precast concrete panels are cast face-downwards in purpose-built moulds, usually made of either timber or fibre glass. There are also highly automated factories with moveable steel beds as a basis for bespoke moulds. By inserting mats or rods in the base of the mould different designs and effects can be created - from false joints to intricate leaf patterns. A steel reinforcement cage is placed in the mould prior to the concrete being poured, designed to meet final structural requirements and those for moving the element during manufacture and installation. Increasingly, maximum use of off-site fabrication is being made by fixing other elements during manufacture, from insulation to entire windows. Once de-moulded, the exposed surface of the unit can be treated in a variety of ways including acid-etched, smooth or coarse ground, grit or sand-blasted, rubbed or polished to achieve a high quality of surface finish.